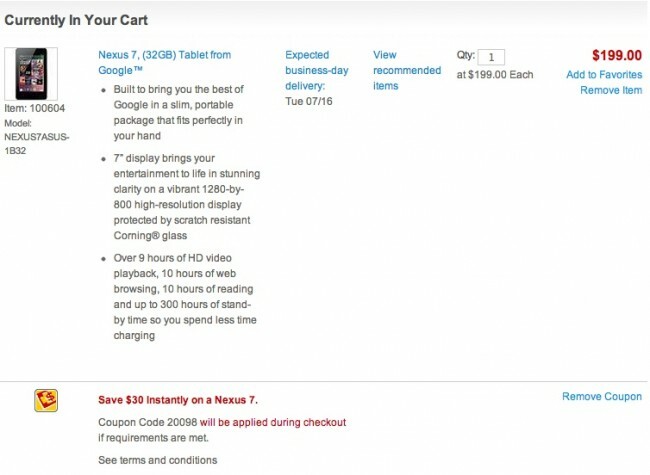 On Monday, Staples dropped the price of the both the 16GB ($179) and 32GB ($199) Nexus 7 models, signaling what most of us assume is a clearing of inventory to make room for the new 2013 Nexus 7. But if the $50 discount on the 32GB version wasn’t enough for you, we have an additional discount of $30 that you can use to drop the price below that of even the 16GB model. All you need to do is enter coupon code “20098” during checkout, and Staples will hack another $30 off the price, dropping it to $169. Even with the new Nexus 7 almost upon us, that’s a heck of a deal. The deal appears to apply to the 16GB Nexus 7 as well, so you would be looking at $149 for it.